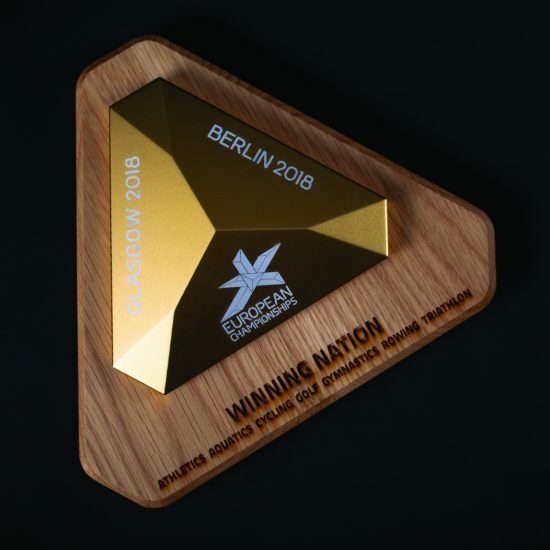 This is the spectacular winner’s trophy that national teams battled for in Glasgow and Berlin throughout 11 days of fierce competition at the inaugural 2018 European Championships. 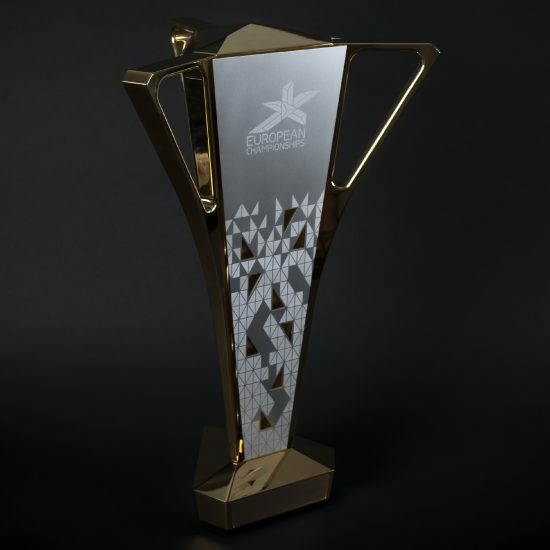 Touch of Ginger was commissioned by European Championships Management to design and manufacture a trophy that would stand out on the world sporting stage. 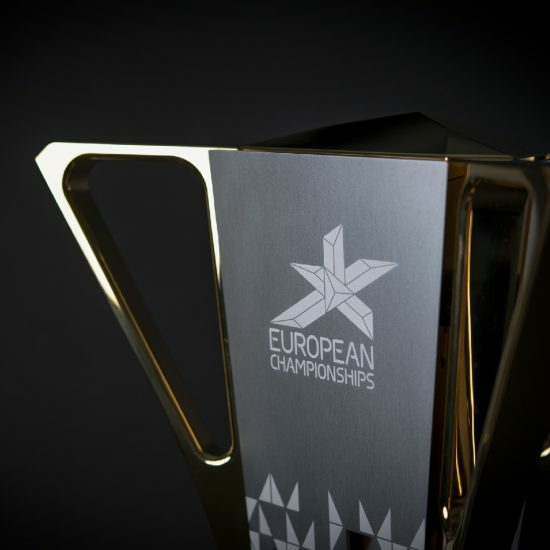 Paolo Barelli said: “The design of the European Championships Trophy has been carefully considered to represent a unifying bond between the competing countries of Europe, the seven sports represented in Glasgow and Berlin and the nations who will be competing to take it back home with them. The trophy will be a fantastic legacy for future editions of our innovative multi-sport championships.”. Crafted from aluminium, finished with 22ct gold plate, a key feature of the new tri-sided trophy is its three large handles – for teams to be able to lift and carry it together in celebration. It stands 650mm high with more than 400mm wing span, weighing in at an impressive 10.5kg. 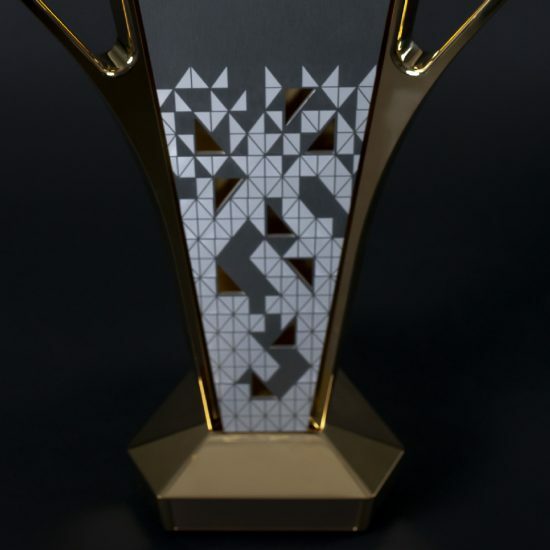 Each of the trophy’s three sides feature an identical European Championships emblem and fretwork of triangular holes designed to reveal the golden interior beneath. We wanted to do something different; from the outset we were sure this trophy should not be a cup style trophy crafted using traditional silverware processes. This one is designed and constructed using state of the art CAD and precision engineered with a chassis and fascia construction. Each fascia features the European Championships emblem visible in all directions. The satin silver anodised finish contrasts with the polished gold of the arms, decorated with a complex laser engraved grid pattern. Triangular perforations provide glimpses through to the gold interior of the trophy. A defining feature of the trophy design is the mirror polished crown at the top of the trophy. This crown was designed to be a detachable element which could be engraved at each championships. It’s traditional to tie ribbons to the winners trophy. The European Championships have no fewer than seven different ribbons creating a rainbow effect of colours, each representing one of the seven sports federations. In addition to the trophy, the seven individual sport federations from the winning nation were presented with an individual gold ingot. Each takes the form of a replica of the gold crown at the top of the trophy, mounted on a plinth of Scottish oak. 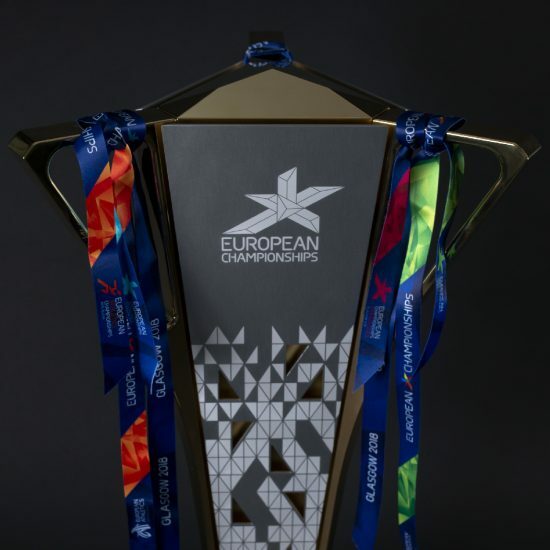 The European Championships Trophy was on show in Glasgow and Berlin throughout the 11 days of competition, and was also made available to broadcasters to display in their studios. It travelled to Berlin to be showcased at the official press conference for the European Athletics Championships, and at the the Opening Ceremony. 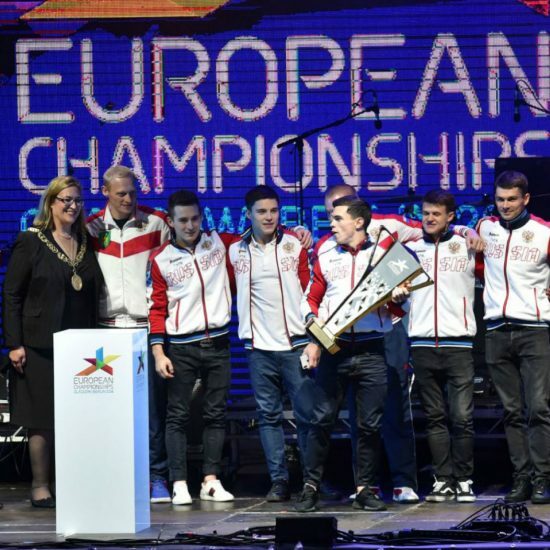 Eleven days of sensational sporting action drew to a close at the 2018 European Championships in Scotland and Germany, with Russia topping the overall medal table, closely followed by joint hosts Great Britain.